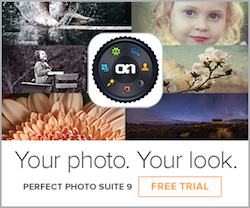 I am giving away a copy of the just released Perfect Photo Suite 9 Premium Edition. Yup! The Premium edition. All seven modules. Totally free. If you haven't moved to Suite 9 yet, now's your chance. I just about live inside of Perfect Layers and Perfect Effects. Nearly every one of my photos is touched by the suite in some way. The tools are a great addition to any post processing workflow. Join my mailing list. There's a big ol' Newsletter Signup button on the upper right of my blog. Click it and sign up. No spam, I promise. I send out a newsletter once a month. And if you're already on my mailing list - great! You're half way there. Share this blog post. Share it on Twitter, Google+, or Facebook. Your choice. Just make sure you tag me somehow or share your post so I know it happened. On Twitter, I'm "@sdaven". On Google+, I'm "+Scott Davenport". On Facebook, I'm "scott.davenport.3760". The content closes on Thursday November 13th 2014 at 11:59 pm Pacific time. On Friday November 14th 2014, I'll select a winner at random. The winner will be contacted by email. I Need Your Help. What Should We Talk More About?